What's Going on with the Sprint iPhone 4S's Data Speeds? Sprint didn't fare too well in our iPhone 4S speed test, but it was at least respectable. 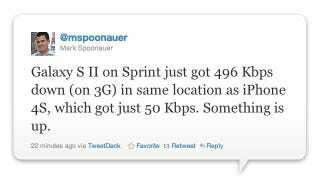 Today, though, we're hearing that Sprint's iPhone 4S is getting tragically low data speeds compared to the Galaxy S II on the same network. Is your Sprint iPhone 4S inexplicably slow today?